Oskar Blues recently started brewing a "Session IPA" from their new Brevard, North Carolina brewery. 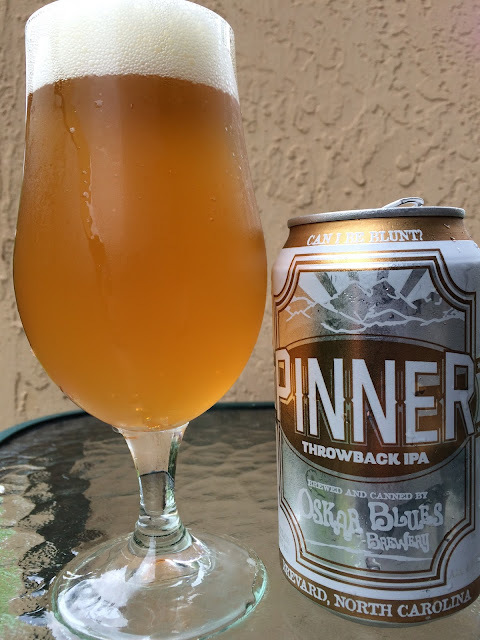 I decided to check out Pinner Throwback IPA today. Of course, it's canned. Gold, white and silver design with the catch phrases "CAN I BE BLUNT?" and "SIP, SIP, GIVE" around the rim. 4.9% alcohol. Canned 05/06/15 and surprisingly "CURES COTTONMOUTH" according to the stamp on the bottom of the can. Fruity aroma, sweet apple and peach with a touch of lemony citrus. Similar flavors, fruity apple and subtle peach, nicely sweet in the beginning. Lemony bitterness follows. VERY DRY! The aftertaste was a little weird. Also, that dryness is HUGE and is the ANTI-COTTONMOUTH CURE! Was OK. Grab Dale's Pale Ale instead every day.